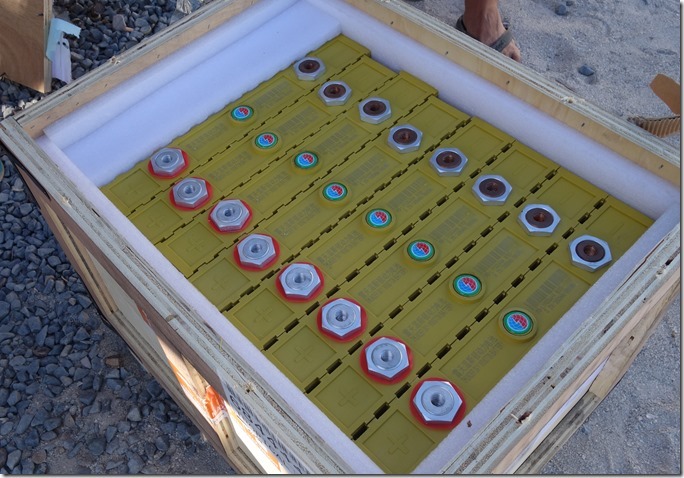 Lithium batteries 1 – YES…. but! It all started in April 2015 during a walk on the banks of the new marina in Papeete. My friend Daniel "Ocean Respect" me blowing up the advantages of the Lithium batteries compared to the traditional lead-acid batteries. It tickled my interest and since then I have stopped to do some research on this technology… Two years later my new 600Ah of Lithium batteries is service and our desalinateur 220 Volt starts producing 100 litres per hour of fresh water without turning the generator. I'm not an expert on the subject. This article is the sharing of the experience gained during my research, design and development implement cell of lithium batteries for the best advantage. The return of experience will come over time, but after 6 months of service the theoretical data are true and all hopes are allowed (see below items of precursors that give a little more perspective). Firstly let's be clear about the technology I'm talking. It's lithium iron phosphate batteries (LiFePo4 or LFP). Not to be confused with other technologies lithium used in portable phones or tablets. This article deals only with lithium batteries (LiFePo4) used as the service batteries on a boat for the storage of energy with currents of load and discharge relatively weak (compared to their use in electric vehicles). Assembly and the implementation of cells of batteries the lithium in a boat requires knowledge in electricity, experience in electrical systems on a boat, tooling and a lot of care. Mistakes can be costly ! There on the market of ready to use lithium batteries in a logic of direct replacement of lead batteries. I'm not interested in them because they represent a much higher investment and, being a new technology, offer much less flexibility to adapt to the evolutions which experience will dictate. But there is no reason to not use them if they come from reputable suppliers and are implemented in a professional manner in a logic of redesign of the aircraft electrical systems. Solar Energy Batteries The Most Secure To Have In Our Homes And Businesses. Lead Acid Batteries and Can Work Between 5,000 and 8,000 Cycles Vs 500 Cycles of Lead Acid Batteries.